Taking up residence in a former place of worship is as much about community as it is about architecture. Rachel McCarthy always knew her home would be different. But the hip clothing store owner never imagined the Bishop of Antigonish would sign the deed or that an acquaintance would say to her, "I used to do cartwheels in your living room." In 2002 when McCarthy and Chad Dunbar purchased the vacant St. Patrick's Hall on the tranquil shores of Lochaber Lake, NS, neighbours had mixed feelings. After all, the former Catholic parish hall the couple planned to call home had welcomed weddings, dances, bean suppers, Brownies, and Girl Guides. It wouldn't be easy for the community to adjust to new-and private-ownership. Churches and church halls are public spaces, deep with memory, and as such neighbours can't be faulted for feeling ownership. Often these structures are living mementos, which people may be reluctant to give up. However, when a church can no longer be a church, it can still often provide shelter and perhaps a new form of sanctuary. Dunbar, whose grandfather used to come to dances here-the Royal Swingsters were popular-says people from the community were happy to see the 1913 building restored. And neighbours have definitely warmed up: "We get a lot of people dropping by," says McCarthy, who is quick to open her home to visitors. "They see we have saved something. This building was something that was going to deteriorate. But now they can come in and see it." As she guides a tour of the main living area, McCarthy, who owns Botica Clothing in Antigonish, NS, says, "We fell in love with it the first time we saw it." The room, which measures 25 x 50 feet with 12-foot ceilings that seem to go on forever, remains largely untouched. The décor looks like it may well have been pulled from a design magazine. Leather couches and chairs share space with a piano from the original hall, a long harvest table, and a settee. Artwork, a grandfather clock and a tide clock help fill the large open space. Underfoot is the original maple floor, running 12 feet in places. The couple extensively renovated the rest of the building. They gutted upstairs, which housed a men's and ladies' bathroom as well as a ping-pong table, added a series of skylights and built a sunroom overlooking the lake. They installed new windows, replumbed and insulated, reshingled, added a new roof, and installed a modern kitchen with ceramic floor and contemporary cabinets on the site of the former stage. The process took eight months. "I never worked so hard in my life," McCarthy says. Mary Collier Fleet is a writer and artist who moved into a former 1902 Anglican church in Renforth, NB, six years ago with husband Greg Fleet and children Sebastian and Hannah. "There was a wonderful benefit of purchasing the church," says Mary. "Pretty well all the kids at their school knew of the church, and so they had kids who wanted to know them, to get to visit the old church." For the first few years after moving in, Greg describes a visitor's typical reaction. "They would walk in the front door into the long hallway, stop, gasp-and say, 'I haven't been in here since my friend was married,' or, 'I went here for Sunday school,' or, 'My grandmother's funeral was here.' We were always quite taken by these, happy that people were able to reconnect to some part of their past, and that we were facilitating that. But after three or four years, it has become both rare and less novel." What does it take to reclaim an abandoned church building? Love. Passion. Elbow grease. And, apparently, divine inspiration. "Church-houses are complicated beasts with lots of surprises, enough to test any faith. I should have known better, being a minister's daughter," says Mary. A church-house is a definite adventure in accommodation, she says, where an owner gets to sit bundled in sweaters under cathedral ceilings, by stained glass windows that have heard joy, grief and struggling faith. Mary says she often thinks of the distant echoes of hymns, the shuffling of polished shoes, and the creaking of bent knees. She also thinks of the prayers released here "and can't help but feel that the replies are still hovering." Other replies aren't so ambiguous: "The first electrician we had out to give us an estimate kept saying, 'I could never live here, I could never live in a place that's had so many dead people it. I've been to funerals here. There have been caskets right where I'm standing. Man, it gives me the creeps.' And my wide-eyed children listened to him, smiling, looking for the dead people in the air," Mary says. Greg, a University of New Brunswick business professor, says the former church-basically two buildings, church sanctuary and church hall, joined perpendicularly-provides a wonderful space in which the kids can run around, his wife can create art, he and the children can perform music, and the family can entertain. Greg praises his wife Mary, saying their home reflects her talents, including the "coolest" couch she recovered with old wool sweaters in a patchwork fashion. When the family moved in, the children were nine and 11. "They have completely loved it," Greg says. He cites another benefit. "We are church-going people, not fundamentalist, but dedicated Anglicans. In some ways, I think Mary and I have always seen our home as a sanctuary for our family. Having a previous place of worship as our new 'sanctuary' only underlined a respect we tried to give our home." After frequently passing a fading landmark 1864 church near the Charlottetown airport, Alberta-born architect Chris Jette says he was almost looking for a use for it. "It's a delightful little building." In 2005 he and his brother Michael rescued the Old Harrington Church, an old-world Scottish craftsmanship house of worship named after the 22nd Earl of Harrington. Today visitors can escape to higher ground with a stay at Harrington House at PEI's Rice Point, a 4½-star cottage, which as a church once welcomed the queen. The upscale rental even comes with a Jacuzzi tub in the steeple. "We are very passionate about our building," says Chris, who has lived in PEI since 1989. Since rescuing the building from demolition, Chris says it has been a labour of love to find a suitable site, develop the plans for its adaptive re-use, and find the skilled manpower to move it to his property and renovate it. Maturing conifers and a view of Hillsborough Bay, Saint Peter's Island and the Northumberland Strait now surround the former church, located on Chris's property in Rice Point, 20 minutes from Charlottetown on PEI's south shore. One of the biggest challenges came in the move. The "beautiful craftsmanship" 1864 roof was brought in one piece by a 100-tonne crane, the steeple was taken apart, the walls collapsed and folded like a deck of cards on a flatbed truck, then rebuilt on the new site. It took a six-person crew seven months to complete. Without exception, everyone who has rented Harrington House or even just walked through the property has been expressive. "As a student, I studied architecture and architectural history in Winnipeg, Halifax and Italy," says Chris. "Ever since, I have been interested in the history and the heritage of the built environment in which PEI is rich. I often wondered why the proportions of some of these old buildings are so perfect." This little church, built by Scottish Presbyterians in traditional Gothic Revival style, was so pleasing that the Protestant and Evangelical Witness, in its Saturday, January 30, 1864 edition, called the building "a neat and comfortable edifice...."
Though moved across the island and reincarnated for a new use, the little church still resonates history-including personal connections, some still evident in the building itself. Chris remembers the reaction of a man in his 60s delivering gravel to the new site. "His eyes lit up and he said, 'I knew I recognized this church! When I was a boy I used to live close by and I cut the grass.' He showed me where he carved his initials in one of the shingles years before." 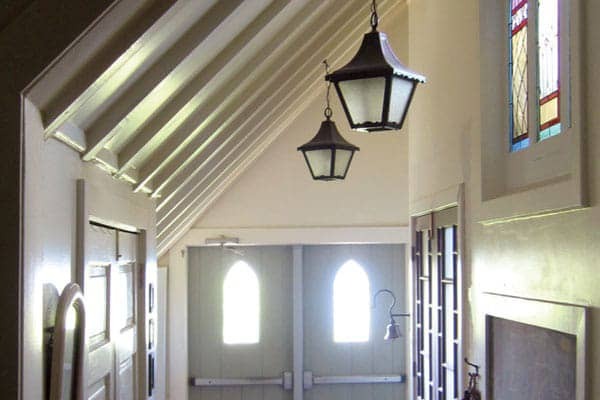 The design respects the quality and character of the old church building by making the exterior as true to the original as possible, Chris says, but changing the building's function gave license to alter the interior dramatically. They went for a sleek, modern style. Chris says he found it satisfying to help save this rich piece of PEI architecture. "It's part of the charm of the island, this Victorian and Neo-Gothic architecture dropped into a pastoral landscape. Preserving a piece of that was quite a thrill."